1. The main difference between public relations and other communications disciplines is the fact that it earns attention. Our messages rest on the credibility of the media channels that pick it up. As such, the industry has a responsibility to earn this attention through authentic, truthful means and only make arguments that it believes in. 2. As frustrations with fake news continue to grow, the value of reach is decreasing while the value of credibility is on the rise. 4. In order to increase people’s ability to spot fake news, we need to start promoting media literacy and instill in them a sense of critical thinking. We need to work toward creating a society where people have the ability to distinguish between credible sources and fake news, and be able to form opinion based on facts rather than confirmation bias. 5. We are increasingly obtaining all of our news from a social media bubble of our own making. As individuals we choose which sources to follow on our social channels and form our thoughts based upon those sources. 6. High-profile individuals and companies need a strategic plan for when they become the target of fake news. Such a crisis plan must be carefully crafted and calibrated. However, depending on the situation, improvisation may be the best course of action. 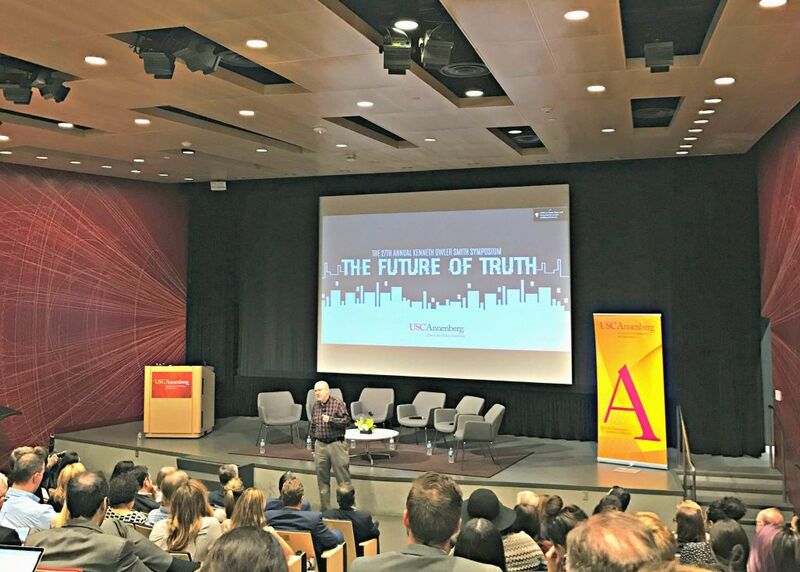 Holmes Report founder and chair Paul Holmes speaking at USC’s annual Kenneth Owler Smith Symposium on the phenomenon of fake news and what PR professionals can do to combat it. 7. As an industry we must draw a clear line between ‘public relations’ and ‘advocacy.’ This requires a commitment to intellectual honesty and not promoting an argument simply because it benefits a client at a certain time. 8. As an industry we are continuing to increase our work in the digital space (social media, websites, etc.). As a result of this, ‘digital storytelling’ is a redundant phrase as storytelling is innately digital as audiences place a high reliability on a company’s own social channels. 9. Fake news has always existed. The rise of social media in the past few years has only amplified this fact as it serves as the information’s main distribution channel, spewing out to the masses at an alarming rate. 10. In addition to promoting media literacy and critical thinking, we need to start educating people to be more scientifically literate. We must stop trying to undermine science and facts. To supplement our work, we should make it a priority to understand neuroscience and cognitive science as well. Mr. Holmes summarizes it best: “Fake news, in its current form, is an existential threat to the PR industry.” As young professionals part of the #NextGenConsensus generation, we have the ability to contribute to the development of public relations, come together to combat fake news, and stand behind the people and organizations working toward a more truthful future.